For me, neighborhood walks are about continuous, auto-pilot movement, but I recently realized that my agenda is incompatible with walking a dog. The "good dogs" need opportunities to engage their noses in sniffing, and the "bad dogs" need a handler who is mentally engaged in training and behavior. We've looked at compromises that make walks more enjoyable for the Good Dog. Now, it's the Bad Dog's turn. For the purposes of this discussion, we'll define Bad Dogs as dogs who bark, lunge, whine, growl, pull, or freeze at any point during a walk. Depending on how your dog behaves, the bad stuff might be something you deal with the whole walk, or only for brief periods of time. 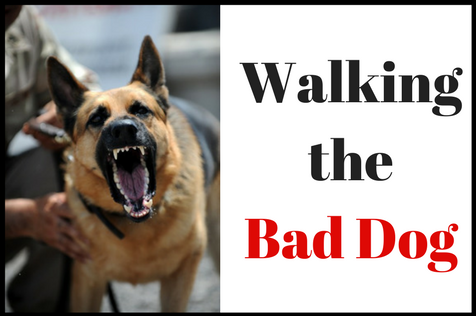 It's crucial to understand that Bad Dogs aren't necessarily having fun on their walks. The barking, lunging, whining and growling is often an outward expression of fear--they're often "bad" because they're scared. Even when these dogs aren't having an external meltdown, they're often internally on edge and anxiously looking for the next scary thing. It could be argued that Bad Dogs who pull are having a good time. They aren't scared of anything in the environment--they're just thrilled to be out of the house! That is certainly the case with some pullers, but there are others who pull because they are overwhelmed. I recently worked with a young pup whose owners reported that she was a hard puller. I took her up the street and her leash manners were great! No pulling at all. Right before we turned around, she heard a dog barking. I had previously observed that barking made her anxious, and sure enough, after the barking she started pulling hard. Regardless of whether or not your puller is overwhelmed, you're likely not enjoying the walks, so that needs to change! 1) Handler engaged with the environment: what triggers are in the area? The most successful handlers notice triggers before their dog does so they can begin interventions early. Reactivity starts before barking and growling, so the solution must also start before barking and growling. The handler has to go into the walk with a plan for teaching the dog how to behave in the world. Because of the unpredictable nature of many neighborhoods, the handler must be prepared to alter her plan at any moment based on the environment and her dog's behavior. 2) Handler engaged with the dog. The handler has to be in training mode: setting the dog up to succeed and then giving frequent reinforcement for making the right choice. This is equally important for the Bad Dog who's scared and the Bad Dog who's thrilled to be out of the house. The scared dog needs his handler to provide clear, consistent communication that his triggers are actually good things instead of bad things. Left to himself, he will continue to believe they're bad things. If your dog is scared of flags blowing in the wind, he needs you to be in training mode for every single blowing flag that he encounters on his walk. For the thrilled dog, a handler on auto-pilot is a recipe for frustration. These dogs needs lots of handler engagement to keep them focused on good manners and self-control. For more information on how to stop barking and growling, check out The Engage-Disengage Game: Help for Reactive Dogs. If you need personalized help walking your bad dog, let's talk about training! But I Want to Walk!